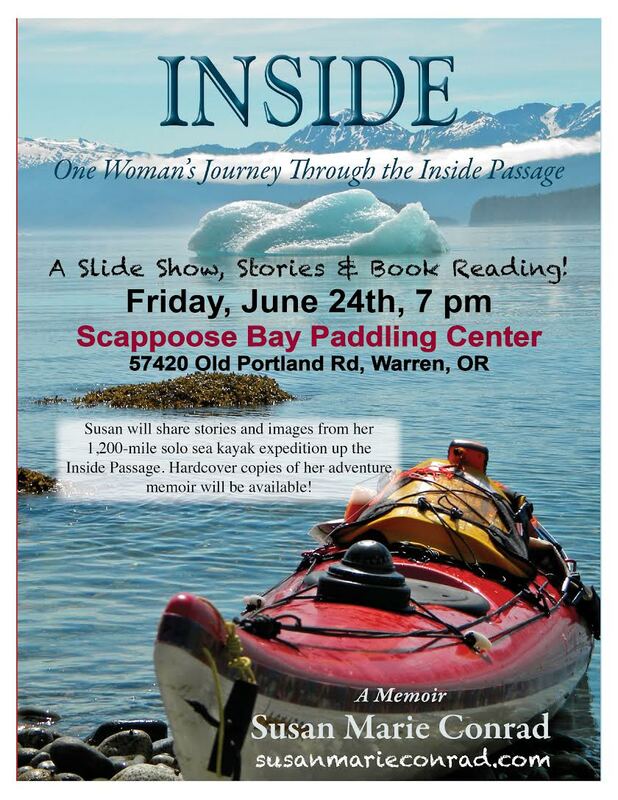 Join us for a FREE presentation on Friday June 24th at 7PM by Susan Conrad about her journey and subsequent book. This will be a fun evening full of great stories and beautiful photographs, you won't want to miss this! THE STORY of a physical and emotional journey through an alluring, perilous, and healing seascape. AN ADVENTURE along the coast of western North America that took the author deep within herself, humbling her, reminding her that she had much to learn as she confronted fear, solitude, exhaustion—and crushing sadness. So much of Inside is about acceptance and gratitude, triumph and tragedy. In spring 2010, with her world scaled down to an 18-foot sea kayak and the 1,200-mile ribbon of water known as the Inside Passage, Susan Conrad launched a journey of the sea and soul that took her both north to Alaska and inward, as she discovered the depths of her own strength and courage. She paddled marathon distances for weeks on end, forged friendships with quirky people in the strangest of places, and pretended not to be intimidated by 700-pound grizzly bears and 40-ton whales.